KATHMANDU, April 24: Nepal Bankers Association (NBA) -- the umbrella organization of 28 commercial banks -- has decided to give continuity to the cap on fixed and saving deposit rates. The decision taken by the meeting of NBA held on Monday comes despite recent reports that the shortage of lendable fund has eased in recent days. Though bank and financial institutions (BFIs) are observing a rise in deposits in recent days, the decision of the NBA to stick with the interest cap on deposit restricts its member banks to review their interest rates. The deposit rate cap, which goes against the competitive market behavior, has been criticized as 'interest cartel' of banks. 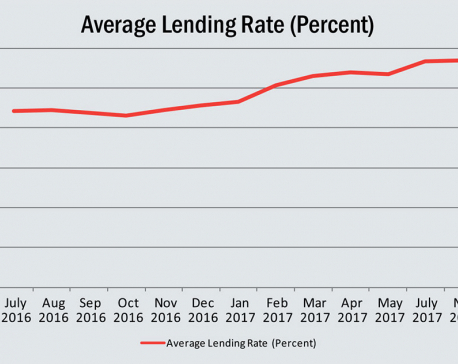 Earlier in January after banks started to compete to hike rates for attracting deposits following acute shortage of lendable fund, the NBA fixed deposit rate at 11 percent and saving rate at 8 percent. NIC Asia Bank Ltd had to face a backlash after it breached the cap and decided to offer higher deposit rates. But, the commercial bank was compelled to withdraw the scheme after the NBA ostracized the bank by deciding that its remaining 27 member banks would suspend interbank transactions with NIC Asia. The 'interest cartel' of NBA has also been enjoying inconspicuous support of the Nepal Rastra Bank (NRB). While the government has been making efforts in recent days to bust the transport syndicate, the central bank -- the regulatory authority of banking institutions -- has been reluctant to stop banks from fixing such anti-competitive practice. However, NBA leaders say that the decision of the organization to fix interest rate cap is a 'general understanding' among bankers to prevent runaway rate hikes. Meanwhile, the World Bank has termed the decision to cap the interest rate an example of 'anti-competitive' behavior. In its recent 'Nepal Development Update' released last week, the World Bank said that the move of the NBA to fix interest rate at a certain level is promoting 'anti-competitive' behavior among banks.